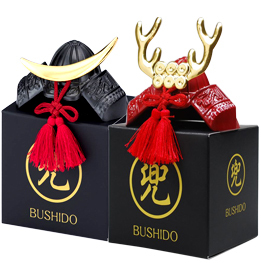 Our popular Kabuto collection adds compact Samurai helmets – BUSHIDO series. Most of the kabuto in this series are around H7 x D8 x W7.2cm. 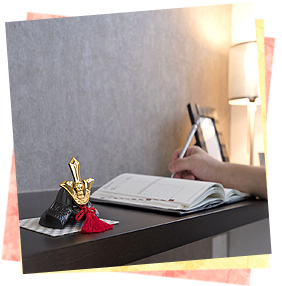 Even though they are palm-sized, the mini Samurai helmets are of an excellent standard in terms of their design and quality. 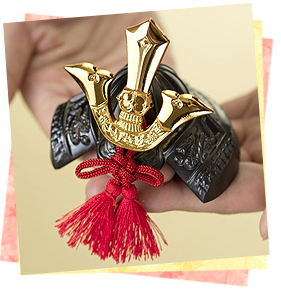 Why don't you find great Samurai helmet (kabuto) ornament in our collection? 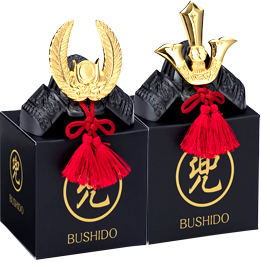 All our "BUSHIDO" collection is made in Takaoka-shi, Japan. The technologies and techniques for the replica helmets have been accumulated for over 400 years in the city. Principal parts of helmets are made of zinc-based alloy, which adds certain grace and dignity to the helmets. Our miniature replica of helmets are solid, detailed, and museum quality. which stored Samurai armour, kabuto and weapons. Copyright(c) 2015 Ginga-do. All Rights Reserved.